Even though Anguilla is only 35 square miles, there is always something to do on this tiny slice of paradise! Anguilla is a British overseas territory in the Caribbean.It is one of the most northerly of the Leeward Islands in the Lesser Antilles, lying east of Puerto Rico and the Virgin Islands and directly north of Saint Martin/St Maarten. The territory consists of the main island of Anguilla itself, approximately 16 miles (26 km) long by 3 miles (5 km) wide at its widest point, together with a number of much smaller islands and cays with no permanent population. The island's capital is The Valley. The total land area of the territory is 35 square miles (90 km2),with a population of approximately 14,500 (2013 estimate). Anguilla reigns supreme as one of the best beach destinations in the world. With over 33 glorious beaches to choose from, your hardest decision some days will be which one to visit. Anguilla has beaches for strolling and shelling, beaches for jogging and swimming, beaches for snorkelling and fishing, beaches for relaxing and reading and beaches for eating and entertainment...the choice is yours. If you are looking for fun and adventure on or under the sea, Anguilla has a number of water sports operators that offer snorkelling, scuba diving, glass bottom boat adventures, day sails, excursions to offshore cays and sunset cruises. With over 100 restaurants around the island, Anguilla is considered one of the gastronomic centres of the Caribbean. From gourmet restaurants to beach bistros and roadside trailers, Anguilla caters to every taste and budget. Be sure to sample some of the island's traditional foods such as fish and fungi, corn soup, rice and peas, crayfish, dumplings and Johnny Cakes....you won't be disappointed. If you prefer to stay in and relax at mealtime, you can take advantage of La Vue's fully stocked kitchenettes that are featured in every room...or indulge in the services of a private chef (there are many around the island) who will cater a private meal for you in your room! Anguilla features an eclectic selection of boutiques and shops, some conveniently located just a short walk or drive from La Vue. You can bring home anything from designer jewellery, beach and resort wear, gifts and souvenirs as well as treasures from around the world. If art collecting is more your style, Anguilla's many art studios and galleries offer up an impressive array of paintings, prints, sculptures and pottery. There are a number of excursion companies on island offering activities both on land and sea, including art and shopping tours, bird watching, hiking, bicycle tours, horseback riding, snorkelling, scuba diving, daytrips to offshore cays and many more. Be sure to ask our helpful front desk staff about the many daily activities on island and discover your favourite Anguilla pastime. getaway, Sandy Island offers visitors a sensational tropical experience. stay connected to the mainland. Every year the island is renewed by forces of nature. Hurricanes, tropical storms and severe wave action all play a part in reshaping the island. Some call it destruction... We call it renovation and renewal. Catch the daily sea shuttle aptly named “Happiness” and escape away to Sandy Island’s magical shores. Sandy Island opened in 1984. With just a little make shift shack for shade, a traditional drum-pan barbecue grill and a cooler stocked with cold beer. The island's 2 man staff entertained boat loads of hungry sun and sea worshippers for many years. The island was and still is used as the backdrop for many weddings, movies, TV commercials, photo shoots and music concerts. In 1995 the island was completely washed away by Hurricane Luis. In 1999 Hurricane Lenny brought new sand deposits and a shipwreck. Since then the road forward has been a labor of love and transformation. In 2007 the restaurant was rebuilt. In 2008 Hurricane Omar renovated. In 2010 Hurricane Earl made his modifications. Today Sandy Island remains even more beautiful. The Cays are located six miles north of Road Bay in Anguilla in the Leeward Islands. The Western smaller cay consists of mainly rocky coral and scrub with no easy access to the island. The Eastern Cay has similar terrain on the south side of the island , but once you pass through the passage between the two cays, on to the north side, you’ll be treated to a long, beautiful white sandy beach and to the turquoise waters of the bay, where you can snorkel amongst the coral reefs. If you choose to explore the rocky coast line, depending on the time of year, you may find a variety of nesting sea birds. Prickly Pear Bar & Restaurant also known as Agatha’s has been in operation for twenty years. The restaurant was tastefully rebuilt after hurricane Luis in 1995 which destroyed 90% of the original buildings. 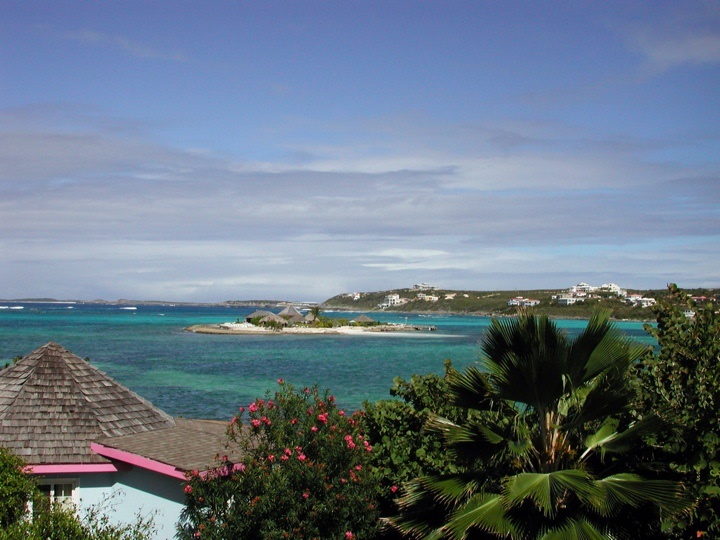 Scilly Cay, a tiny coral based island crowns the bay in the village of Island Harbour. Its low island vegetation and tiny sand beach made it the perfect spot for a daytime restaurant. The island is owned and operated by Eudoxie & Sandra along with their two sons Brandon and Alexander who are dedicated to making your stay on Scilly an experience to remember. It's simply the best in the Caribbean! We highly recommend renting a car while on Anguilla especially if you will be staying more than 3 days. Car Rentals are definitely more convenient as you have them at your leisure, therefore you are free to come and go as you please. Renting a Car on Anguilla is quite easy. If you do not feel like going through the trouble yourself (even thought is no trouble at all) we can certainly take care of this request for you. Here on Anguilla we drive on the left. You will also need a temporary driving license to drive on the Island which is avaialble via any Car Rental Company at a cost of US$20.00 (cash) per driver or US$25.00(credit card). This will also be delivered with the vehicle. Your temporary license is valid for 3 months so no need to worry if you are a long term guest. Car Rentals on the Island ranges from US$35.00 (low season) - US$55.00 (High Season) per day, most companies also offers optional insurance of US$5.00 - US$12.00 per day depending on the company of choice. Vehicles can also be delivered to La Vue and returned at your port of Deprature, whether that being the Ferry Terminal or the Airport. We normally recommend local companies, however International Companies are avaialble in Anguilla as well such as Hertz, Avis & Thrifty. Taxis: Taxis on Anguilla are a bit costly, however definitely the way to go if you do not wish to drive while on your vacation. Taxis can be requested from our Front Desk approximately 20 minutes prior to your requested time. Last minute request are certainly accepted, however this might cause a bit of a wait. Bicycle Rentals: Bicycle rentals are certainly available on Anguilla the company we recommend charges a rate of US$15.00 – US$18.00 per day plus US$15.00 deliveries and pick up fee. This includes helmet, lock & key. This service can definitely be secure upon your arrival at La Vue at our Front Desk.